Ernest Dale Tubb (February 9, 1914 – September 6, 1984), nicknamed the "Texas Troubadour," was an American singer and songwriter and one of the pioneers of country music. His biggest hit song, "Walking the Floor Over You" (1941), marked the rise of the honky-tonk style of music and was written by Tubb himself. He was the first of the honky tonk singers and the first to achieve national recognition, followed by such greats as Hank Williams, Lefty Frizzel, and George Jones. Joining the Grand Ole Opry in 1943, he opened his famous Ernest Tubb's Nashville Record Store in 1947, hosting the popular Midnight Jamboree radio show from its premises. In 1948-49, Tubb was the first singer to record a hit record of "Blue Christmas," a song more commonly associated with Elvis Presley and his mid-1950s version. Another well known Tubb hit is "Waltz Across Texas" (1965), which became one of his most requested songs and is often used in dance halls throughout Texas during waltz lessons. In the early 1960s, he recorded duets with then-new star Loretta Lynn, including their hit "Sweet Thang." His voice remains one of the most recognizable in country music, and his band, the Texas Troubadours, featured some of country music's finest players, who created the classic sound of Texas honky tonk music. Tubb was born on a cotton farm near Crisp, Texas (now a ghost town), in Ellis County. The youngest of five children, Tubb's father was a sharecropper, and the family moved across the state to Benjamin by the time he was six. His parents divorced a few years later, and Tubb spent his youth living with each parent and working on farms throughout the state. Tubb was especially inspired by early country singer Jimmie Rodgers, the "Singing Brakeman," and spent his spare time learning to sing, yodel, and play the guitar. At the age of 19, he landed a job as a singer on a San Antonio radio station. The pay was low, so Tubb also dug ditches for the Works Progress Administration and then clerked at a drug store. Tubb was a long-time regular performer and host at the Grand Ole Opry. In 1936, Tubb contacted Jimmie Rodgers’s widow to ask for an autographed photo. A friendship developed and she was instrumental in getting Tubb a recording contract with RCA. His first two records were unsuccessful, one of which was a tribute to his childhood singing hero, entitled The Passing of Jimmie Rodgers. After a tonsillectomy in 1939 affected his singing, he turned to songwriting. In 1940, Tubb switched to Decca records to try singing again and it was his sixth Decca release, with the single "Walking the Floor Over You," that brought Tubb to stardom. Tubb joined the Grand Ole Opry in February 1943, and put together his band, the Texas Troubadours. He remained a regular on the radio show for four decades. He also hosted the Midnight Jamboree radio, which originated in Tubb's record shop in downtown Nashville. The show made the store famous, as it became a popular night spot for country music performers and tourists alike. 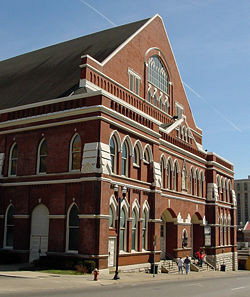 In 1947, Tubb headlined the first Grand Ole Opry show presented in Carnegie Hall, in New York City. Among his better known hits were: "Two Glasses Joe," "Tomorrow Never Comes," "Drivin' Nails in My Coffin," and "Let's Say Goodbye Like We Said Hello." In 1949, at the height of his popularity, Tubb had an amazing 13 hit singles in one year. He was a friend of famed singer-songwriter Hank Williams, and supported him during his struggles with the Opry due to alcohol abuse. During the 1950s, Tubb recorded and toured regularly, and scored more than 30 hits, including "Driftwood on the River" (1951) and "The Yellow Rose of Texas" (1955). His hit records in the late 50s and early 60s rarely reached the Top Ten, but he was still packing concert halls. Among his later hits were "Thanks a Lot," "Pass the Booze," and the classic, "Waltz Across Texas." Several duets with Loretta Lynn were also successful. In 1965, Tubb was inducted into the Country Music Hall of Fame and in 1970, Tubb was inducted into the Nashville Songwriters Hall of Fame. Despite being diagnosed with emphysema, he continued touring and recording, creating several minor hits. A tribute album produced by Pete Drake in 1979, The Legend and the Legacy, featured Tubb's original classic recordings with stars such as Willie Nelson, Merle Haggard, Charlie Daniels, and Chet Atkins overdubbing their voices and instruments. Ernest Tubb died of emphysema at Baptist Hospital in Nashville, Tennessee. He is buried in Nashville's Hermitage Memorial Gardens. Tubb always surrounded himself with some of Nashville's best musicians. Jimmy Short, his first guitarist in the Troubadours, is credited with the characteristic Tubb sound of one-string lead guitar picking. From about 1943 to 1948, Short featured clean, clear riffs throughout Tubb's songs. Other well-known musicians to either travel with Tubb as band members or record on his records included steel guitarist Jerry Byrd, and Tommy "Butterball" Paige, who replaced Short as Tubb's lead guitarist in 1947. In 1949, guitarist Billy Byrd—no relation to Jerry—joined the Troubadours and brought jazzy riffs to the instrumental interludes, especially the signature four-note ascending riff at the end of his solos that would become synonymous with Tubb's songs. Actually a jazz musician, Byrd remained with Tubb until 1959. Another Tubb musician was also his producer, Owen Bradley. Bradley played piano on many of Tubb's recordings from the 1950s, but Tubb wanted him to sound like Moon Mullican, the honky-tonk piano great of that era. The classically trained Bradley tried, but couldn't quite match the sound. Buddy Emmons, another steel guitar virtuoso, began with Tubb in about 1958 and lasted through the early 1960s. Emmons went on to create a steel-guitar manufacturing company that bears his name. In the 1960s, Tubb was well known for having one of the best bands in country music. The band included lightning-fingered Leon Rhodes, who later appeared on TV's Hee-Haw as the guitarist in the show's band. Ernest Tubb did not possess a great voice, but its deep resonance and Texas drawl made it easily recognizable, fitting perfectly with his laid-back, honky-tonk style. With typical Texas charm, Tubb sometimes mocked his own singing. He once told an interviewer that 95 percent of the men in bars would hear his music on the juke box and remark to their girlfriends, "I can sing better than him." Tubb added that they would be right. His humor, humility, and low-key stage personality were off-set by his striking, lanky frame, high cheek bones, and chiseled feature, the epitome of the "long, tall Texan." Tubb inspired one of the most devoted fan bases of any country artist. His fans followed him throughout his career even until the 1970s, when Tubb's singing deteriorated significantly and his band was not nearly as adept as in the heyday of the Texas Troubadours. However, Tubb would "bring the house down" every time he broke into "Waltz Across Texas" or another favorite. 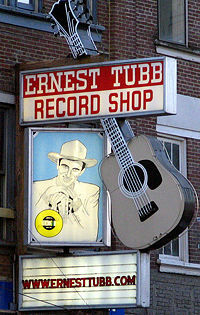 His Ernest Tubb Record Shop in Nashville, which opened in May, 1947, has been a meeting place for country music stars and fans for decades and is one of the most photographed landmarks in Nashville. One of his sons, the late Justin Tubb (1935-1998), was a successful country musician in the 1950s and 60s. This page was last modified on 17 August 2017, at 14:11.